Rarely have school science fairs, a source of pride and panic for generations of American students, achieved such prominence on the national stage. President Obama held one at the White House last fall. And last week he said that America should celebrate its science fair winners like Sunday’s Super Bowl champions, or risk losing the nation’s competitive edge. Yet as science fair season kicks into high gear, participation among high school students appears to be declining. And many science teachers say the problem is not a lack of celebration, but the Obama administration’s own education policy, which holds schools accountable for math and reading scores at the expense of the kind of creative, independent exploration that science fair projects require. “To say that we need engineers and ‘this is our Sputnik moment’ is meaningless if we have no time to teach students how to do science,” said Dean Gilbert, the president of the Los Angeles County Science Fair, referring to a line in President Obama’s State of the Union address last week. The Los Angeles fair, though still one of the nation’s largest, now has 185 schools participating, down from 244 a decade ago. In many schools, science fairs depend on teachers who shoulder the extra work. They supervise participants and research, raise the money for medals and poster boards, and find judges — all on their own time. To organize the Northeastern Minnesota Regional Science Fair this weekend, Cynthia Welsh, a science teacher at Cloquet High School near Duluth, has logged more than 500 unpaid hours since September. “My husband helps,” Ms. Welsh said. In middle school, science fair projects are typically still required — and, teachers lament, all too often completed by parents. And some high schools funnel their best students into elite science competitions that require years of work and lengthy research papers: a few thousand students enter such contests each year. But what has been lost, proponents of local science fairs say, is the potential to expose a much broader swath of American teenagers to the scientific process: to test an idea, evaluate evidence, ask a question about how the world works — and perhaps discover how difficult it can be to find an answer. The local fairs, which rose to popularity after World War II, have historically provided entree to science for those who might not consider themselves science fanatics. Comprehensive national numbers are hard to come by, but Ms. Glidden said that several major regional fairs have been unable to scrape together the number of high schools required to participate in the Intel fair in recent years. “At the high school level, it’s on the decline,” she said. In Indiana, high school participation in the state’s science fairs dropped 15 percent in the last three years. One fair organizer in Washington described last year’s fair there as “heartbreaking,” with few projects and not enough judges. The fair in St. Louis was in danger of folding this year when its major sponsor, Pfizer, moved its operations and dropped its sponsorship. One obvious reason for flagging interest in science fairs is competing demands for high school students’ extracurricular attention. But many educators said they wished the projects were deemed important enough to devote class time to them, which is difficult for schools whose federal funding hinges on improving math and reading test scores. Under the main federal education law, schools must achieve proficiency in math and reading by 2014, or risk sanctions. The Obama administration has urged broadening the subjects tested under the law — possibly including science. But some teachers say they are already burdened by state requirements to teach a wide range of facts — say, the parts of a cell — which prevents them from devoting class time to research projects. 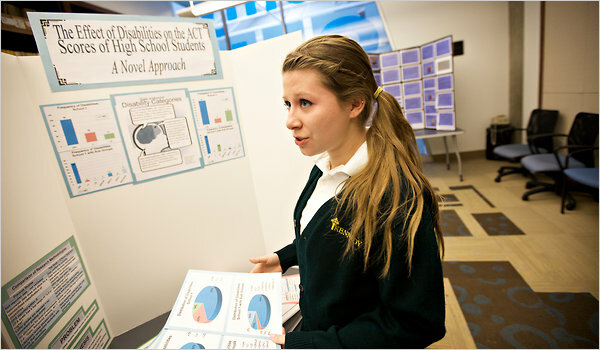 “I have so many state standards I have to teach concept-wise, it takes time away from what I find most valuable, which is to have them inquire about the world,” said Amanda Alonzo, a science teacher at Lynbrook High School in San Jose, Calif., who advises her science fair students during her lunch and late evenings after school. Some time-strapped teachers seek out scientists in industry and at universities to work with science fair students, but such connections are difficult to make. Even in the heart of Silicon Valley, it took two months of concerted effort before Craig Young, a physics teacher at Wilcox High School in Santa Clara, Calif., found a professional mentor to advise two students who wanted to use bacteria to generate electricity. He posted on the National Lab Network, a Web site devoted to such collaborations, but his requests went unanswered. Still, several hundred thousand American high school students will participate in more than 350 science fairs during the next three months, with nearly a dozen on Saturday alone. They include Melissa Rey, 17, who is glad that the St. Louis Honors Science Fair this weekend was able to find a new sponsor. 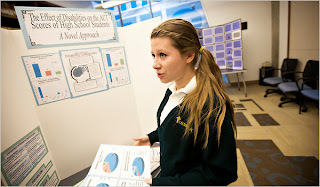 “I love going around the science fairs and looking at everyone else’s projects,” she said. A junior at John F. Kennedy Catholic High School, Ms. Rey, who has dyslexia, examined the effect of disabilities on the college entrance test scores of high school students. Jeffrey Schwehm, a biochemistry professor at Lakeland College in Sheboygan, Wis., managed to recruit 16 high school participants for the fair he organized, in part by promising them that they would be done by 1 p.m. so they could get to their sporting events in the afternoon. In St. Petersburg, Fla., on Saturday, more students from private high schools than public schools will be attending the Pinellas Regional Science and Engineering Fair, a shift over the last decade. And over all, there will be fewer students participating. Still, Paul Dickman, a science teacher at Lakewood High School in St. Petersburg, who has run the fair for 20 years, said he was looking forward to it. Mr. Dickman said he would spend Sunday getting the fair winners’ plaques engraved for the awards ceremony next week. Because whether or not they are hailed like Super Bowl champions, some celebration is in order.